The judge said the killing was an "act of love"
A 100-year-old former butcher has been spared a prison sentence for killing his wife after the judge accepted his plea of diminished responsibility. Bernard Heginbotham pleaded guilty at Preston Crown Court on Thursday to the manslaughter of his wife, Ida. She was living at a nursing home in Preesall, Lancashire, and in poor health when her husband slit her throat, the court was told. Mrs Heginbotham was found by staff at the home on 1 April. Her husband cried in court as he was given a 12 month community rehabilitation order. 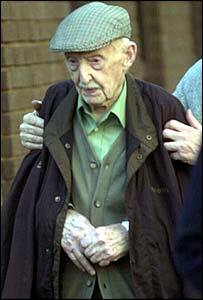 Mr Justice Leveson said it was clear Mr Heginbotham had been a devoted husband during their 67-year marriage. His 87-year-old wife was found with a single knife wound to her throat. 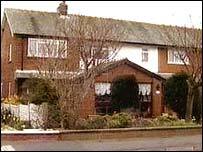 The couple, who lived in Preesall, near Blackpool, had raised six children together. Hilary Banks, prosecuting, told the court Mrs Heginbotham had become dependent on her husband after she had been hurt in several falls. She was in need of specialist care and had been moved between different care homes. The court heard how he had become upset as his son, Neville, told him in a telephone conversation that his wife was to be moved to another care home. "He admitted that he went to the home with a weapon and injured his wife which resulted in her death," Ms Banks said. "He didn't want his wife to be moved again and didn't think she was going to receive the care he wanted her to have." Mr Heginbotham was arrested by Lancashire Police on suspicion of murder at his home on 1 April, where he was found to have attempted suicide. When he was arrested, he told officers: "My poor Ida." On sentencing, the judge said: "Bernard Heginbotham, the killing of your wife, to whom you had been married joyously for some 67 years, followed by your attempt to take your own life, was an act of desperation. "It was carried out in an effort to end her suffering while you were under intolerable pressure. "It was in truth, an act of love and I have no doubt you suffered a medical disorder at the time and the responsibility which you bear is substantially reduced. "It was, as you will well know, a terrible thing to do but I accept entirely the circumstances in which you did it and your feelings of guilt and remorse have been truly overwhelming." Det Insp Phil Burke said: "It's difficult when you see a man like that in court but at the end of the day he's killed his wife and I think it's right that he comes to court and the court have got the range of sentences available to decide in controlled circumstances what is to be done." Family solicitor Alan Godwin said they were relieved the case was over and thanked all involved. He added: "Their hope now is that their father will be allowed to spend what time remains to him privately and peacefully in the company of his family." A spokesperson for Age Concern said: "This is a tragedy for everyone concerned. The impact of home moves can be devastating for older people. Older people are often forced to move from a home where they are comfortable as their health deteriorates. "There needs to be greater flexibility to ensure that, where possible, additional services are put in place to enable a person to stay where they are." "He had been happily married for 67 years"